Rather than needing more self-control, our children need better self-regulation -- a way to understand and manage their stress and energy -- to succeed in life. "For a man to conquer himself is the first and noblest of all victories." Thus wrote the philosopher Plato in the 4th century BC, thereby instilling the idea that character is built upon self-control. Wrong. Many years of research and experience as a psychologist have shown me how misleading this notion is, even as experiments like the famous "marshmallow test" seemed to confirm it. Rather than needing more self-control, our children need better self-regulation--a way to understand and manage their stress and energy--to succeed in life. What exactly is different about self-regulation? 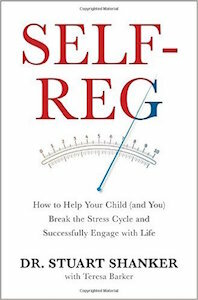 As I explain in my new book, Self-Reg: How to Help Your Child Break the Stress Cycle and Successfully Engage with Life, self-regulation is about recognizing when we are over-stressed, identifying our sources of stress, reducing their intensity, finding places of calm, and learning ways to rest and recover. Understanding the distinction between self-regulation and self-control is essential to understanding how to help our children. I've seen hundreds of children and their parents in my professional capacity and have never once seen a "bad" kid. Every single child, when met with understanding and patience, can be guided along a trajectory that leads to a rich and meaningful life. But stereotypes of the "difficult child" too often color our views, as do the dreams, frustrations, and anxieties we suffer as parents. When we impart negative judgments on children, we are just mistakenly shifting blame for our own emotions and insecurities onto our children's "nature." This means that children who react with hostility or by shutting down are likely showing the outward signs of an inward experience of stress overload. If we don't recognize the signs, figure out what is stressing them, and help them to cope--instead of using blame, threats, or punishments--we will continue to make matters worse for them, rather than better. A parent's reaction to a child's stress is important to their later ability to self-regulate, starting in the first years of their life. Nature intends for human parents to play a close, nurturing role with their offspring and to take advantage of the "interbrain"--the shared intuitive channel of communication between a parent and child that is maintained by touch, shared gaze, voice, and, most of all, shared emotion. This is what helps a stressed child develop a way of self-soothing that will stay with them and allow them to cope with stressors in their lives. Providing warm, nurturing care early in life can go a long way toward stress management. But that doesn't mean that parents are solely responsible for their child's ability to adapt. Even kids who have enjoyed warm, nurturing parenting can have trouble with self-regulation. That's why it's important to understand how it works and how we parents can help. A lot of your work as a parent involves learning how to understand the meaning of behaviors that you would otherwise find troubling or irritating. If you learn to read the signs and recognize them for what they are--a signal of a system on overload--you will be able to resist assigning blame or labels to your children. Reframing your children's behavior as a reaction to stress rather than willful misbehavior, and learning to listen to your children and to observe them with curiosity, is the first and perhaps most important step in self-regulation. Stress in children often involves disappointments in their relationships, schoolwork, and other purposeful activities, or having too much to do in too little time. But stress can also be hidden and have biological sources. For example, some children are highly distressed by too much noise, light, or odor, and this can cause ongoing problems in their lives that may be hidden from you. They may also find boredom, waiting, or sitting still extremely stressful. Stressors can come from many sources--biological, emotional, cognitive, and social domains--so it's important to consider all of these. Though our environment may be highly stressful to our children, we often overlook information that could alert us to this fact. We--or they--may carry on as if it doesn't matter. That doesn't mean that their unconscious mind isn't registering the stress and responding with stress, though, which can in turn create a fight, flight, or freeze response. Parents can look for patterns of behavior--such as children always breaking down around 5:30 pm--to help figure out what their children's stressors are--perhaps they are hungry at that hour. Or, if it's less obvious, try reviewing in your head the different domains of their lives and what might be causing stress. Whatever you do, don't become a further drain on them by reacting in anger or judgment. Instead, try to listen and calmly affirm what seems to be going on for your children. It's amazing how simply reducing sources of stress can change a child's behavior quickly. 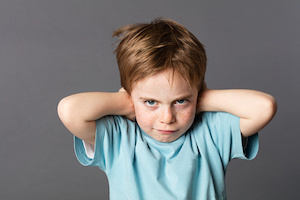 I once saw a child who was sensitive to noise, light, and textures labeled as a "problem child" by his teacher, only to have that opinion completely reversed when she realized that dimming the classroom lights changed his demeanor drastically. Sadly, the child had had to endure her judgment, communicated through raised voices and hardened facial expressions, for some time prior. In fact, she'd also labeled his father and grandfather as difficult. The same thing can happen to parents who don't pay attention to what stresses their children and bring it into their conscious awareness. Once sources of stress have been identified, it's much easier to either help our kids avoid them or to mitigate them, as best we can--perhaps by moving our dinner hour earlier or dimming the lights or giving them a hug after they've failed a test. Sometimes, reducing our children's stress involves understanding what stresses us out and how it impacts our behavior. Learning how to soothe our own stress can help us self-regulate our emotions and lead to less reactivity toward our kids when they are suffering, as well as provide important role modeling for them. We all need strategies for reducing tension and replenishing our energy. No one size fits all, so it's important to read the signs in your children, recognize their unique sources of stress, and make sure their self-regulation strategies fit their needs. Mindfulness has been touted as a way to instill calm energy and to make our children more aware. But sometimes our children can get so used to feeling excessive stress that a state of hyper-alertness becomes "normal," so much so that sitting still and focusing on their breathing--a typical mindfulness exercise--can be a thousand times more distressing than being manic. Helping your children to slowly develop an awareness of their inner states and to find relaxation techniques that help them calm down can be incredibly empowering. Teaching your children mindful breathing--if done slowly and with supports in place--can be one technique to help them increase awareness of their need for calm. But it's important that calming techniques are experienced by your children as enjoyable, too, and don't add to their stress inadvertently. There are many relaxation exercises that produce calm, such as practicing yoga, taking a walk, or working on art projects, for example. Encourage your children to experiment with what helps them most and support them in finding relief. When you help your children find self-regulation strategies, be careful to consider the distinction between "quiet" and "calm." For example, a child may be quiet when playing video games, but no one would mistake that for calm, and you shouldn't either. Their brains are producing stress hormones galore when they are engaged and quiet playing video games. The point of finding strategies is not to make your life easier in the short run (by having your kids remain quiet), but to make their life easier and more productive in the long run (by helping them handle stress in a calming manner). Of course, following my advice doesn't mean that your children will never misbehave, or that all of their problematic behaviors are a response to stress. But, so much of the time, misbehavior is a cry for help--a cry that we, as parents and adults, need to answer with compassion and understanding, not punishment. Following the steps of self-regulation does not guarantee your child will suddenly stop irritating or frustrating you, but it may help prevent some unnecessary suffering. Our research has shown that following these steps is a powerful way for children to change their behavior. When your children see that you truly understand them and that you are committed to doing what you can to help, it will go a long way toward improving your relationship with them, as well as their ability to cope with life's challenges.